Let’s go back in time. The scene is January 2005. I’m eighteen years old, a freshman in college, away at a retreat for the weekend. My best friend Kacey and I were pretty cool. Or at least, we thought we were pretty cool. How cool? Cool enough that when a group of guys along on the retreat decided to brave the 30-degree temperatures and spend the night in a treehouse instead of in the retreat cabin with bunk beds, the two of us decided to join the party. I write this and laugh, because I would never, ever do this now. I despise the cold and prefer to sleep in fleece pants and a sweatshirt with my mattress heating pad ON. Times have changed. But then the appeal of being the only two girls to brave the cold and hang out with the boys all night won out! You don’t need me to go into details about the horror of that evening. I still shiver just thinking about it. I have vivid memories of, after sleeping not a wink all night, trudging back through the snow, pillow and sleeping bag in hand, to the cabin. While the others spent the day playing games and hanging out, Kacey and I collapsed in the bottom bunk of a bed and literally slept the day away. We’re older now, and debatably wiser. We still think we’re cool, but you won’t find us having winter sleepovers in treehouses! Instead we do things like host ugly Christmas sweater parties (or pajamas, in my case!) 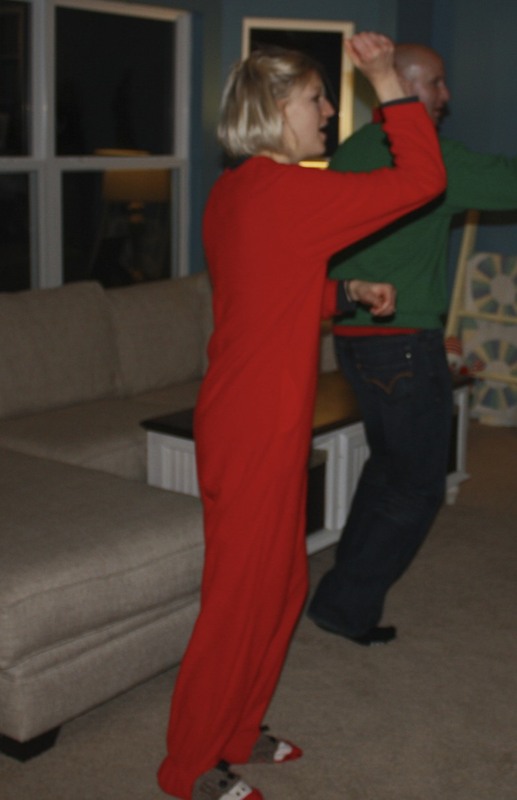 and fulfill our performance dreams in front of a TV with Wii’s Just Dance 3. Need proof? See below. And then forget you saw that and instead focus on one of the snacks that fueled our dancing that evening: fresh spinach and artichoke dip with bacon. 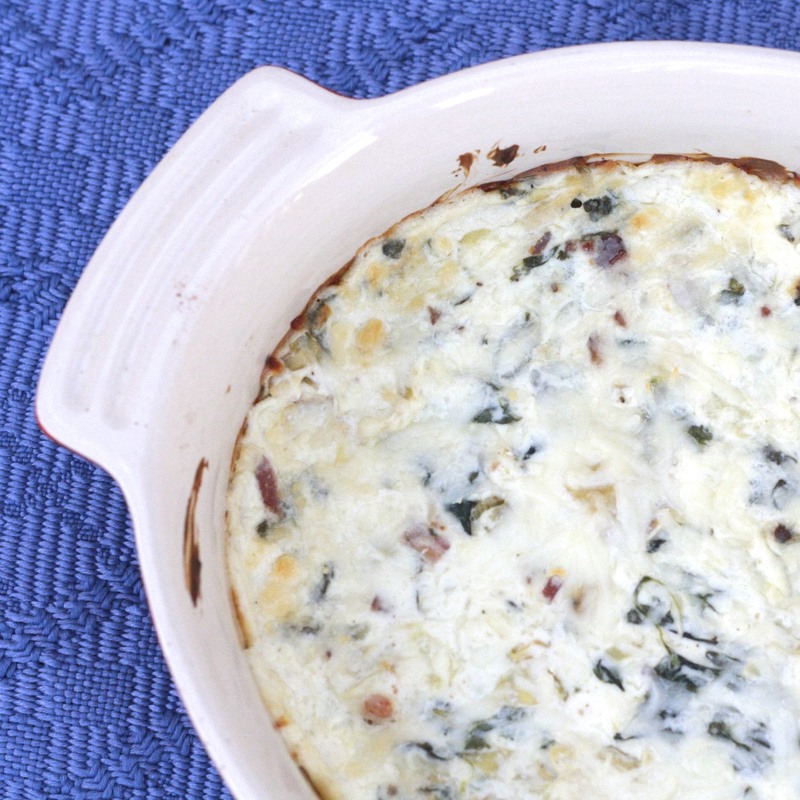 Another winning Jessica recipe, this takes your standard spinach artichoke dip up a notch with the inclusion of fresh spinach as opposed to frozen and bacon…because bacon makes everything better! 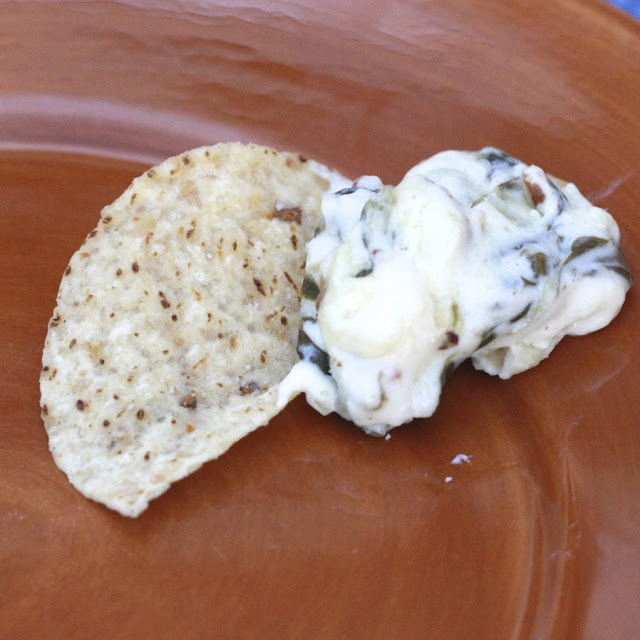 Whether you’re looking for a performance-enhancing snack to share with your best friend or you just need a really great New Year’s Eve appetizer, this dip is your thing! Cheesy, gooey, WARM…much warmer than that night almost seven years ago! Love the spinach artichoke combo? Try this flatbread pizza! 1. Preheat oven to 400F. In a skillet over medium heat, heat olive oil. Add spinach, garlic, and shallots, stirring until spinach cooks down. Set aside. 2. In a large bowl, combine cream cheese, mayo, and sour cream. Beat until smooth. Fold in 1/2 cup of each cheese along with the spinach mixture, artichokes, and bacon. Spread into a baking dish and sprinkle with remaining cheese. 3. Bake at 400F for 20 minutes. Serve with bread, chips, or crackers.